I would like to transfer songs from iPhone to Mac, because iPhone memory is not enough to use, whether I need a tool to help you to transfer music to my Mac, because iOS device is not allowed to direct transfer music from iPhone to Mac, whether you have any idea? If you have the same problem as jackonestyle, the article is right for you. The post focuses on solutions on how to transfer music from iPhone to Mac without any data loss. There are three methods that you can choose anyone you like according to the actual need. 2. Plug iPhone into Mac via USB cable, and then iTunes will automatically start. If not, you’ll need to manually open it. 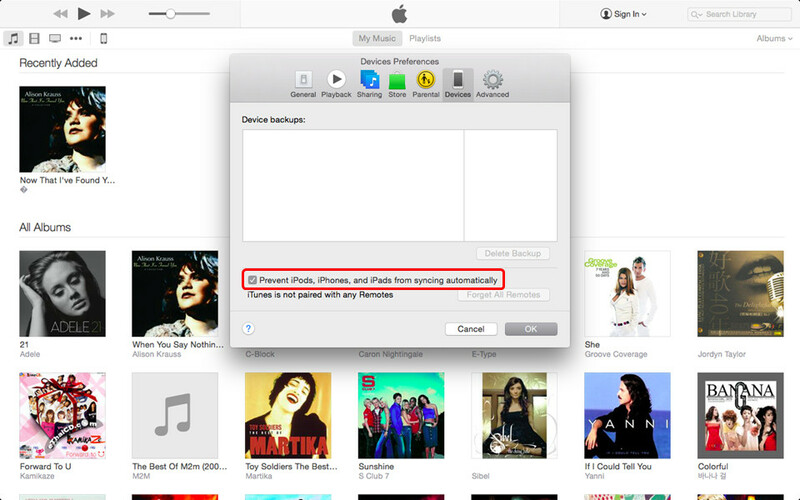 With this method, iPhone users are able to move the purchased music files from iPhone to Mac computer easily. However, many iPhone users worry about the loss of the non-purchased music files in their iPhone, so they want to find other ways to finish the music transfer. People can also use cloud services like Dropbox, Google Drive and so on to transfer music from iPhone to Mac. Setting Dropbox as an example, iPhone users only need to install this app on their iPhone and the Mac computer, and then they can sync the music files between iPhone and Mac computer with one Dropbox account. iPhone users only need to upload the music files to the cloud with their iPhone, and then the music files will be shown in the folder on the Mac computer. iPhone users can download the songs from Dropbox folder to their Mac computer. Of course, email is also helpful on this issue. Users are able to add the music files into email as an attachment, and then decompress the attachment on their Mac computer. This email method is suggested to be done over Wi-Fi connection, so it is not that convenient for all iPhone users.The third-party iPhone transfer software will also help people to transfer music from iPhone to Mac computer. The following post will introduce you two professional iPhone transfer software for Mac. Check it out if you are interested. 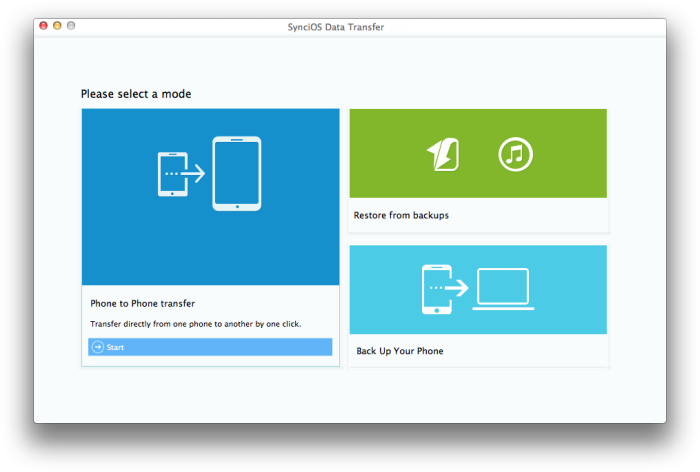 SynciOS Data Transfer for Mac is a smart and powerful iPhone transfer tool for Mac, which allows you to transfer data from iOS to iOS, Android to Android, iOS platform to Android platform and Android platform to iOS platform. It supports almost all types of data such as videos, music, photos, applications, SMS and contacts between Android and iPhone without any loss of data. You can backup all iOS and Android phone data to your computer with the software. You can then transfer the backuped files to any phone of your choice. iTunes backups can also be managed with Syncios Phone to Phone Data Transfer software. However, the trial version of Syncios Phone to Phone Data Transfer has limitations and the user can only transfer contacts. Other features are unlocked after one purchases the program. Step 1. Connect Your iPhone to Computer, and then run Syncios Data Transfer. Step 2. 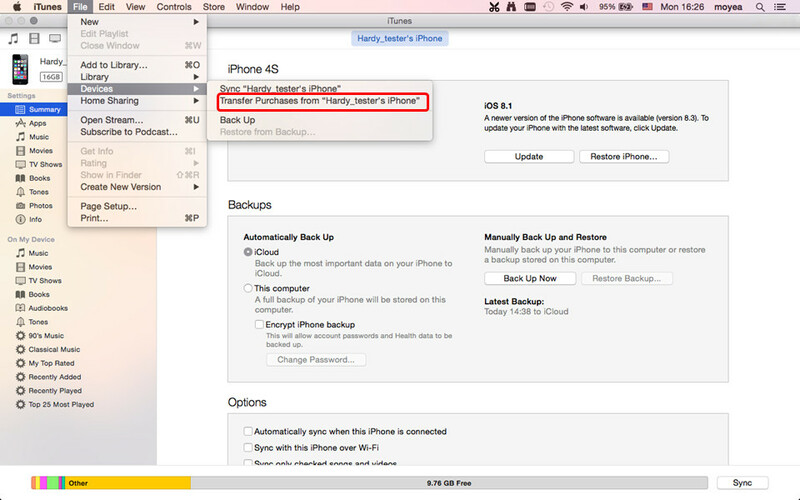 Click Backup your Phone to transfer your iPhone music to Mac. Go back to homepage of Syncios, click on Backup your Phone option to bring up the Backup Panel. The files will be automatically checked and listed on the main window. Step 3. Select Music, click Start Copy, Syncios Data Transfer will start to transfer music from iPhone to Mac computer. Among all the transfer programs, Leawo iTransfer is one of the best. 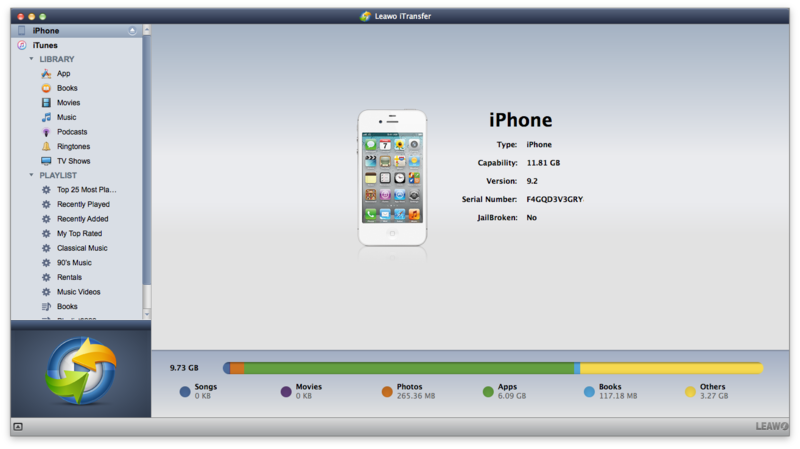 Leawo iTransfer is a powerful iPad, iPod and iPhone transfer program which makes the data transfers among iOS devices, iTunes and PC incredibly easy, and it also helps to backup iPhone, iPad and iPod data to computer. It is user-friendly, and users are able to handle it with no efforts.The following guidance will show you how can you transfer music from iPhone to Mac with Leawo iTransfer, and you are allowed to free download this software to have a try. Note that the trial version has limited transfer times. 1. Run Leawo iTransfer and connect iPhone to computer with the USB cable. The software will automatically detect the libraries of your iPhone, and then list the libraries in the left sidebar. 3. After selecting music files, the dialog of transfer settings will pop up. Check “Save to Folder” and click “Change” to choose a folder on your computer as target. If you want to save the music files to iTunes library, just check “Transfer to List: iTunes” in the dialog. Then click “Transfer Now” to start transferring music from iPhone to Mac computer. 4. The progress bar in the pop-up dialog will show you the percentage of the transfer process. The names of the music files will also be shown in the dialog. When the transfer is ongoing, please don’t disconnect your iPhone. After the music transfer, you will get the music files in the target folder. The following chart is about the comparison between the two iPhone transfer software and iTunes, and you can choose anyone you like according to your actual need. Maybe here are other methods you could think of transferring music from iPhone to Mac computer. You can feel free to have a try.